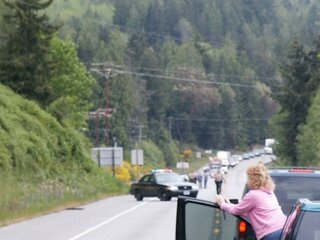 On our way up to Sequim last Friday, we saw a police chase end. There was a road block set up and we waited for maybe 10 minutes for everything to end. We don't know what happened, but we're glad we weren't involved. You can see the black line on the edge of the road to the right, that's the spikes the policemen were waiting to use if necessary. Fun stuff! The guy being chased slowed down and pulled over once he saw the road block. Nothing spectacular, but you don't see this every day around here!